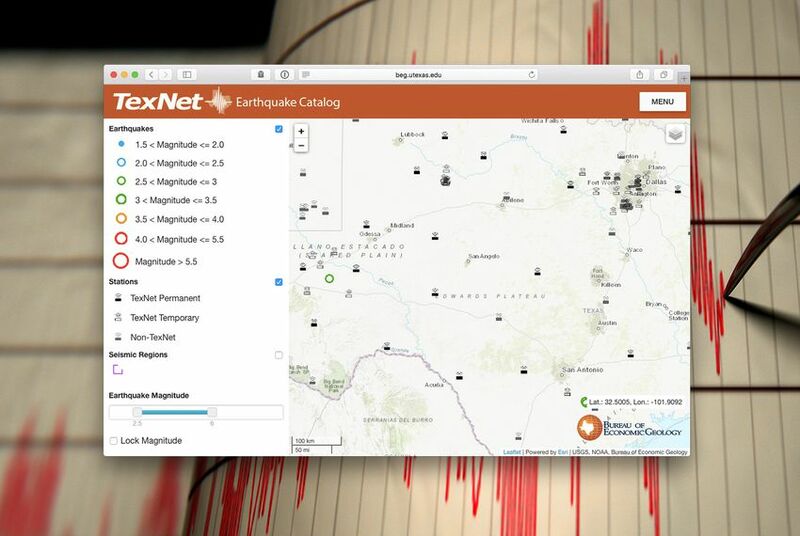 A new interactive website from state-funded researchers is tracking tremors across Texas – part of an effort to understand the link between earthquakes and oil and gas production. Three years ago, a series of quakes rattled North Texas — and some residents’ nerves. Larry Walden, a Parker County commissioner, remembers a public meeting at the time in which residents complained about cracked houses, damaged foundations and even a hen that had stopped laying eggs. That sensor, installed last year, is just one node in a statewide network called TexNet that monitors quakes and tremors across Texas. Run out of the University of Texas at Austin’s Bureau of Economic Geology, the program was created by the Legislature and Gov. Greg Abbott in 2015 after a series of temblors shook the Dallas-Fort Worth region. Texas saw an uptick in quakes starting in 2008, and a growing body of research has linked fossil fuel activities – specifically the injection of oilfield wastewater into the ground – to the shaking. Industry representatives and state regulators have been wary of acknowledging a connection, arguing more detailed information is needed. That's where the TexNet Seismic Monitoring program comes in. The goal is for the network of sensors, now collecting data across the state, to suss out the source of the tremors. "You have a very complex issue, and a lot of people have tried to oversimplify it," said Steve Everley, a spokesman for the industry-funded group Texans for Natural Gas. "We need to get good data; we need to have good research. This is a program that obviously leads us toward that goal." Peter Hennings, a research scientist with UT-Austin's Bureau of Economic Geology, said initial TexNet data shows "earthquakes happening in key areas in Texas that have really been known about for a few years" – mainly hubs of oil and gas production. As the program amasses more data, “we'll be able to start to look at the earthquake rate and ask the question, ‘Is it increasing or decreasing in a given area?’” he said. "We're moving pretty swiftly in the direction of being able to provide answers." Scientists have long established that injecting fluid deep underground – a technique used to dispose of oilfield wastewater – can trigger earthquakes. And in recent years, the U.S. Environmental Protection Agency and researchers at Texas universities have pointed to the wastewater disposal process as a likely culprit behind shaking in the state. Cliff Frohlich, a senior research scientist at the University of Texas at Austin who has studied seismicity for decades, said "some companies in [the] industry have been very forward-looking about getting some of their best people working on this," while "others have stuck their heads in the sand or been very secretive." The Texas Railroad Commission, the state's oil and gas regulator, also has seemed to have a "vexed relationship" with the issue, Frohlich said. The commission has panned much of the research linking quakes to oil and gas activities. But in 2014, the agency approved regulations requiring disposal well operators to submit more geographical information and hired a staff seismologist. "There's been, I'd say, a difference between their sort of public face on that and their activities," Frohlich said. The regulations allow for permits to be amended or wells shut down due to seismicity. Since they took effect, the commission has received 114 disposal well applications in "areas of historic seismicity," said Ramona Nye, a spokeswoman for the commission, in an emailed statement. Of those, 60 were issued with special conditions, including some related to injection volumes and pressure. Another 15 of the applications were returned or withdrawn. “The commission has long recognized the possibility of induced seismicity related to fluid injection; that’s why the [commission] has in place some of the most stringent rules in the nation to address the issue," she said. Everley, the Texans for Natural Gas spokesman, credited the Railroad Commission's regulatory overhaul with a subsequent decline in earthquakes in the state. In a risk assessment for 2017, the U.S. Geological Survey said the odds that a manmade earthquake would hit Texas this year had plummeted. The year before, the state was pegged as the third-most at-risk for them, behind only Oklahoma and Kansas. But Luke Metzger, the director of the advocacy group Environment Texas, said that the oil and gas industry – backed by government regulators – continues to downplay the link between quakes and disposal wells. There's already a "body of science," he said; officials should now be taking steps to reduce the risk, such as recycling fracking water instead of injecting it into the ground. The TexNet program’s creation in 2015 came with a $4.5 million infusion from the state. With it, program leaders were able to buy dozens of seismometers – devices that monitor earthquakes – and bring on a team of researchers to wrangle the collected data into useable insight. Two years later, the program has placed a grid of those sensors across the state. An interactive website that went live in October streams data from those monitoring stations to show every quake with a magnitude of 1.5 or greater. Alexandros Savvaidis, a research scientist at the Bureau of Economic Geology, spent months meeting with landowners and scouting out possible sites for the sensors, which track when and how much the ground shakes. “We had 18 stations before TexNet,” Savvaidis said, referencing seismometers operated by Southern Methodist University researchers and the U.S. Geological Survey, a federal agency that generally tracks earthquakes with a magnitude of 2.5 and greater. “Now, in 2017, we have almost another 60” monitoring stations in the state, Savvaidis said. Permanent stations are spread evenly across the state like a backbone, Savvaidis said, while temporary stations have been deployed to places that reported seismic activity in recent years, including the oil-rich Permian Basin. “The new network will give us the possibility to work more on the seismicity – to have better data, better information, that will help us understand this phenomenon," he said. Todd Staples, president of the Texas Oil & Gas Association, an industry trade group, said the Legislature was smart to fund the TexNet program. Petroleum industry groups have also contributed more than $1 million to related research efforts. "The data being produced is a good resource for academia and industry," Staples said in a statement. "All Texans benefit from good, science-based research." Frohlich said seismicity research in Texas can be divided into two eras: pre- and post-TexNet. If the program continues to be funded, he said, it's "going to be a huge change in the way earthquake activity can be met, managed and analyzed." "I can't say we've solved the induced earthquake problem," he said, "but we know a lot of things that we didn't know before." Disclosure: The University of Texas at Austin, Southern Methodist University and the Texas Oil & Gas Association have been financial supporters of The Texas Tribune. A complete list of Tribune donors and sponsors can be viewed here.